The Farm-to-Table Restaurant serves up delicious and filling plates mainly composed of Atitlan Organics' and other local farm products. Currently, Atitlan Organics supplies all of the milk, yogurt, cheese, salads, cooking greens, honey, coffee, chicken, taro root, pigeon peas, and herbs to the restaurant. The restaurant is run by three young, local, aspiring chefs named Antonio, Maricela, and Petrona. They are amazing! And we offer two ways to enjoy it: treat yourself to a meal at the Farm-to-Table Restaurant, or place an order with Atitlan Organics for pick-up. 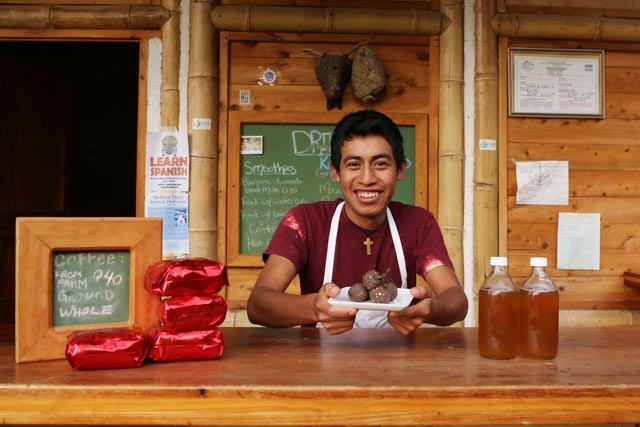 Atitlan Organics has a fully operating kitchen that is run by a qualified chef. All the food that is served in the restaurant is from the farm. We serve breakfast, lunch and dinner. This is a great way to end a day spent exploring Tzununa or a great option for those guests who don't feel like cooking. We are proud to sell our produce to the community. We believe in healthy food for healthy communities, and distribute orders out of the Bambu Guest House in Tzununa. Please order the day before by calling us at +(502)-4681-4697, or messaging here, so we can set your stuff aside, as we do sell out quickly! Orders are ready for pick-up at 10:00 a.m. the next day.